agarGEL precast gel and a high level of reproducibility can be obtained 150-210 min. Simplified routines for ensured reliable operation. 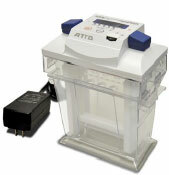 Chamber without integrated power supply also available. Casting set includes 8pcs of column,dialysis membrane, fixing ring, syringe and column cleaning brush. Temperature controlled PAGE system with buffer circulator (optional) .